I had this idea that I think is pretty cool. So inevitably it will catastrophically fail and become archived in my recycling bin with all the others. You will never guess where my inspiration came from. At the age of 9 dad gave me a Swiss Army knife. It was the most incredible present. Never had I owned anything that could disarm a blackhead with its intricate tweezers, cut butter (like a knife through butter), and still intimidate your classmates during show and tell. This versatile tool stayed in my pocket for almost 8 years, and I can recall countless situations where it was invaluable. Unfortunately it was lost in an alcohol related tragedy, but definitely not forgotten. The point is, with this tool I must have discovered thousands of applications that I doubt it was designed for, and that is special to me. 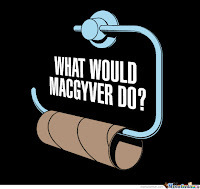 The ability to improvise and adapt when required is a skill that I find to be critical in everyday life. 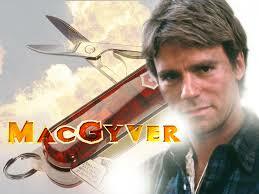 For those of you who don't know who the guy above is, allow me to introduce McGyver. This man was quite iconic in the 80-90s. Most likely for his outspoken nature, quick thinking, and irresistible mullet. He was able to get out of practically any sticky situation with his trusty Swiss Army knife and duct tape roll, and then seduce the nearest woman. As a result I would classify him WAY cooler than James Bond (screw you Pierce Brosnan!). Imagine a TV game show that attempts to release the inner "MacGyver" in a number of contestants that are competing against each other. Individually, contestants would be placed into an isolated room (e.g. shipping container, warehouse, water tank). Within this room there would be a challenge, or multiple challenges and several strategically chosen "random" items such as a coat hanger, hacksaw, aluminium can. The challenges would initially be quite simple and achievable: Untie yourself from this chair, create a weapon, escape from the room etc. Contestants are expected to use what materials are available accompanied with their ingenuity and resourcefulness to solve the problem. If the contestant is able to complete this task (sometimes in timed conditions), they are able to progress to the next round and choose an item to proceed to the next round with (players are unaware of the future challenges). The show would progress over a season of episodes, with challenges becoming relatively complex and challenging (e.g. defuse a bomb, create fire with these chemicals, fix this machinery). An excellent understanding in engineering, science and badassery will be critical. Some rounds may contain interesting twists to challenges such as a double contestant challenge where teamwork is required, or a blind challenge in the dark, underwater challenge etc. As competitors get eliminated each week, the show will become more personal. The viewers will become familiar with the competitors interests, personality and techniques. Eventually the ultimate survivor will emerge victorious. I expect that people will naturally be interested in this show because they like to think and discuss what they would have done in that situation. It is almost just as testing for the viewers at home (and at times more frustrating). Let me know what you think, suggestions you might have or potential challenges in the comments! Definitely got potential. A real life Hunger Games using MacGyver techniques might get me interested!